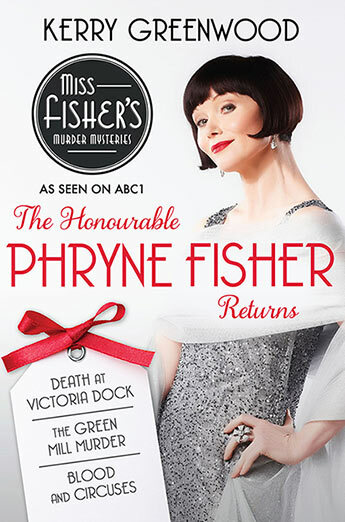 Phryne Fisher, the 1920s most elegant and irrepressible sleuth, returns in her second three adventures - bound together in one great value volume. This fabulous compendium of the fourth, fifth and sixth books in the critically acclaimed and much-loved Phryne Fisher mystery series, sees the divine and delectable Hon Phryne Fisher now comfortably ensconced in Melbourne society - but among the parties, the dancing, the flirtations and the assignations, somehow murder always finds a way in. In Blood and Circuses, there have been strange things happening at Farrell's Circus and Wild Beast Show - someone seems to want it to fail, and is prepared to resort to poison, assault and murder. Phryne goes undercover as a trick horse-rider, but she'll need all her tricks, intelligence and courage to see her through this mystery. Death at Victoria Dock sees Phryne tangling with bank robbers and anarchists on her way through tatoo parlours, pubs and spiritualist halls to find out who murdered a very young man who died in Phryne's arms. But when her beloved maid, Dot, is kidnapped, there's nothing that will stand in Phryne's way. In The Green Mill Murder, Phryne finds there are hidden perils in dancing the night away - like murder, blackmail and young men who vanish. But there are compensations to this case, including a dashingly handsome band leader, some fancy flying across the Australian Alps and a most unexpected tryst with a gentle stranger.